When it comes to instruments, none are as wonderful to listen to than the violin. 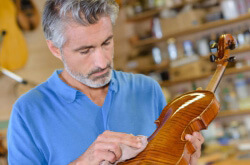 However, when it comes to violin tuning, many people don’t know which violin tuners are the best violin tuners, or sometimes even how to tune a violin properly. Due to there being no frets on a violin, it tends to make a violin rather difficult to tune accurately, without the aid of a violin tuner. So when it comes to tuning a violin, how would you go about doing that? Before we have a look at tuning the violin using a piano, tuner, or any other means, we need to have a look at the question of “how do you tune a violin?”. To do that, we need to understand the violin, and a few terms that surround it. How Is a Violin Tuned? Types of Violin Tuning & How to Use Them? How to Tune a Violin by Ear? How to Tune a Violin With a Tuner? A violin is made up of three main parts, namely the fingerboard, the tuning pegs (attached to the pegboard), and the body. Of course the violin strings are also a component, and we’ll get to them shortly. When it comes to tuning, the pegboard is the main component used, however there are also some fine-tuners attached to the body of the violin, and these are generally used when tuning the violin to the level of accuracy required for precise, beautiful music. Now we come to the strings. 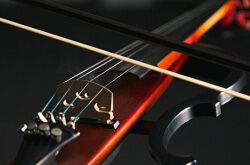 The violin strings are named after music notes, and the notes are G, D, A, and E respectively (each string being higher than the previous one, going from left to right). The strings are hooked into the fine-tuners in the lower-half of the violin body. The strings then go over the bridge, and all the way to the other end of the violin, where they’re attached to the tuning pegs. Whether you’re using a piano, a violin tuner, or an app on your phone, there are a few basic principles that still apply when tuning a violin. The basics that have to be followed, are the four violin notes mentioned earlier. These are often called the “violin tuning notes”, and remembering which ones they are is vital when it comes to tuning a violin. The first thing when wanting to know how to tune a violin for the first time, is to choose the right string. The orchestral violinists generally start with their “A” string, the “D” string, “G” string, and finally the high “E” string. The reason for this has been speculated to be because the “A” and “D strings are closed to the middle of the fingerboard, and so less warping and damage to the violin will occur, but the results is that the tone of the violin generally sounds better. However, when we look at the actual tuning of the violin, the best practice is as follows. The violinist first gets each string to within a semi-tone of the required note, either by copying the notes on the piano, or by using a violin tuner. Once each string is close enough, then they switch from tuning using violin pegs, to using the fine tuners at the base of the fingerboard. The function of the violin fine-tuners is inherent in their names, as you use them to get the violin strings from “almost there” to pitch perfect. Getting the pitches accurate using the tuners though, varies from tuner to tuner. Now that you know the basics of how to tune a violin with the pegs, it’s time to learn about the various methods that go along with tuning a violin. The few main ones are tuning by ear, and using a violin tuner (the latter being the most accurate of the three methods). 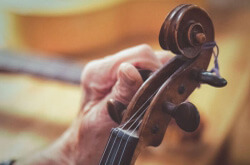 Tuning a violin by ear will require one of two methods, either using a piano, or doing what is called “relative violin tuning”, which is tuning the violin based on the pitches of the other strings. When tuning the violin using the piano, it’s best to start with the “A” key on the piano, and then play the “A” string on the violin at the same time, and compare whether the violin note sounds higher or lower than the piano note. Then it’s a simple case of adjusting the violin’s tuning peg (if it’s a huge difference) or fine-tuner. After which you simply repeat the same process for each string, and there you have it! Make sure to check each string again with the piano once tuned, as sometimes the strings stretch a little when the other strings are tightened. Relative tuning on the violin doesn’t require a tuning at all, and is pure “tuning by ear”. How it works, is by starting on the low “G”, and moving up from there. What you need to do, is place your fingers on the violin’s fingerboard in the “whole-note, whole-note, half-note, whole-note” position (also known as the 1, 2, flat-3, 4 position). Now, if the fourth finger is placed correctly, the pitch should be identical to the next string. If the next string up is off, then all you do is adjust the fine-tuner accordingly, and move your hand one string higher in that same position and repeat. In time, you’ll get to the stage where you will play two adjoining strings at the same time, listening for the “perfect fifth” note difference. The more experienced you are, the easier it will be to hear and adjust, but in the initial stages, using the “fourth-finger” method of relative tuning should work for you. Tuning a violin with a tuner sounds pretty complicated, but it’s actually simpler than tuning using the conventional methods. Again, it’s recommended to start from the “A” string, but other than that the process goes as follows. Start playing your violin string, and see which note registers on the violin tuner. Adjust higher or lower, depending on what the note is, until the tuner is showing the desired note, in this case “A4”. You can use the tuning pegs for this step. Once the correct note is showing on the screen, use the fine-tuners to adjust the note until it no longer shows # or b on the screen (which means sharp or flat). Repeat the process with the other three strings, making sure each is in tune. Go through each string once more, to make sure that it’s still in tune. That’s the reason why violin tuners are recommended when it comes to standard violin tuning, as it takes less time and effort to tune the violin, than it would through conventional means. Now that you know that violin tuners exist, you might be wondering “which one is the best violin tuner?”. Well, that depends on your budget, location, and accuracy requirements. There are a score of violin tuners out there, some advanced in technology and nature, and others so simple a child could use them. There are violin tuners for mobile phones, and even some that you can load onto your computer. The clear solution would be to list our top choices for each medium then. A standard violin tuner is one that you can use anywhere, is often battery powered, and can hear and measure the pitch of your violin, in order to tell you if you’re sharp, flat, or on key. The following list showcases a few of the best violin tuner options on the market, as well as their pros and cons. They’re not listed here in any particular order, as it’s best for each person to test a violin tuner for themselves, to see how they feel after they’ve used it. The Snark Violin tuner is one of the tuners on this list, because it’s one of the most popular ones used today. 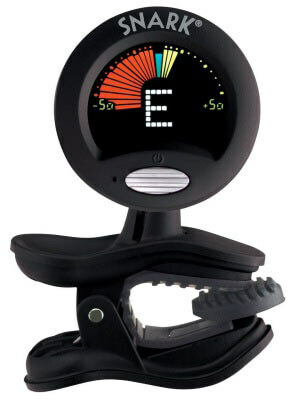 It’s a clip-on tuner, which means that it can pick up the notes through the vibrations of the violin. This is particularly useful when it comes to noisy environments where the violinist is having a hard time hearing themselves think, let alone tune the violin. However, due to the size of the tuner, a few of the fancier enhancements that can be found on other tuners are lacking here, such as setting a key, or a particular note. That being said, the note-finding abilities of the SN-5 are nothing to be sneezed at. In short, this tuner is perfect for a violinist, due to the 360 degree swivel head, the clip-on functionality, and the affordable price. This one could possibly be the best violin tuner for beginners though, as its easy to read and use. Although they’re known more for their electronic keyboards, KORG have designed a good electric violin tuner as well. The CA-30 is versatile, as it has both a built-in microphone, and a cable input for electric instruments and violin mics. Another benefit that it provides, is the ability to sound any note you wish, in order for you to hear whether you need to tune your violin higher or lower, although this is only useful for beginner violinists, learning to hear pitch intonations. However, as it’s also a violin chromatic tuner, it means that there’s a high level of pitch accuracy offered. In short, this tuner is a good violin tuner. It’s versatile, and can be used for many different instruments. The versatility of the cable input means this is definitely one of the tuners to look out for, and the price isn’t too high either. It’s an advanced violin tuner, but definitely one of the best violin tuner metronome devices, as it has a loud speaker, which can be easily heard. 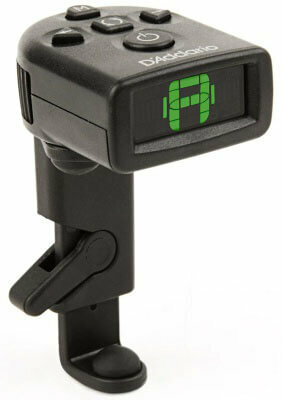 This tuner is another clip-on violin tuner, and it’s as good as the other ones listed. This one is useful for orchestra violinists and musicians, as it picks up the vibrations of the instrument it’s attached to, and tells you how to adjust based on that. It uses a back-lit screen to show you your pitch, which means that in low-light situations, it will show you the pitch, without shining a light for the world around you to see too, which should keep the attention away from your violin. 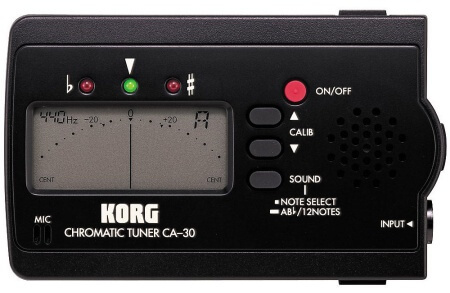 This tuner is reasonably priced, but could be classified as a cheap violin tuner, if you hunt around a bit for it. It’s great for orchestra musicians, or any violinist that has to play on stage, due to the small size, and low light it produces. Not sure if it’s worth the price compared to a few other violin tuners though. 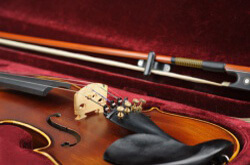 Some might be confused as to why a tuning for would make it onto this list, but they have earned their places in the list of best violin tuners, as they have been around the longest, and can be used over and over without losing power or pitch. The OG violin tuners. 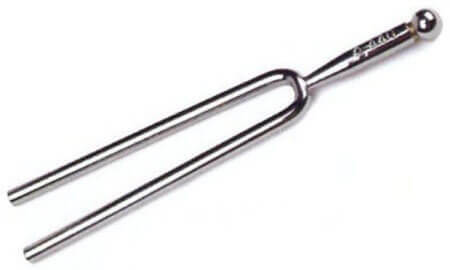 Both a cheap violin tuner, and a classic one, the tuning fork is the best violin tuner for beginners wanting to teach themselves intonational tuning, as well as being affordable. The next section is about violin tuners that you can get for your mobile phone. Again, the best violin tuning apps listed here aren’t listed in any particular order, as each person needs to test a violin tuner for themselves to see which one works for them. So whether you’re looking for the best violin tuner for android, or the best violin tuner for iPhone, experimentation is required. What are the benefits to using a violin tuner app though? Well for starters, convenience. In this day and age, everyone carries around a smartphone with them, and the processing power of the phone means that it’s easy to download and use a pretty powerful digital violin tuner. The ClearTune violin tuner app is fantastic. It’s used by celebrity musicians to tune their instruments, and so it should be more than enough for you as well. This paid app features chromatic violin tuning, manual and automatic note selection, as well as transposition functionality when you need to change the key of your violin. In short, you can’t go wrong with the app. It’s easy to use, and because of your phone’s mic, it means that you can tune any acoustic violin with ease! The cost is low, and it can be used on most smartphones, which means you won’t be limited by the phone you use. Definitely a digital violin tuner you’ll want to get. 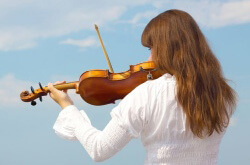 Another mobile violin tuning app, this one is equally popular. 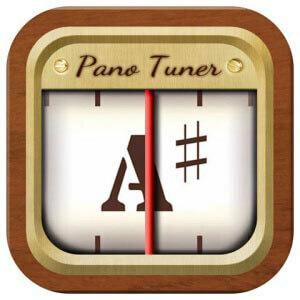 Pano Tuner is a chromatic violin tuner, with frequency sensitivity like you can’t believe. This app can hear discrepancies in pitch up to 30 times per second, which means that you will be able to find the “concert A pitch” in no time. It has a retro feel to it, which is quite popular amongst a few of the more “old school” violinists, as well as rock violinists. Tends to slow down older devices, very RAM hungry. 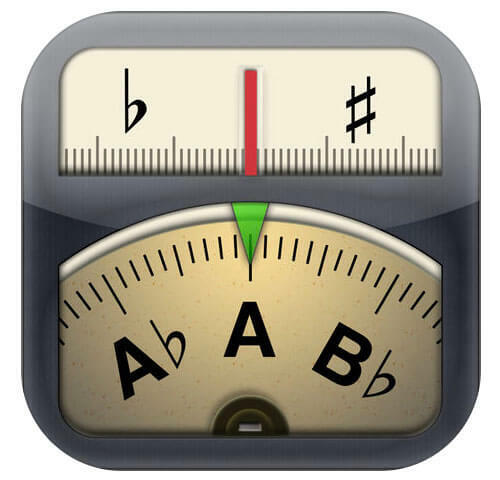 This violin tuner app is great for anyone needing a portable violin tuner, without needing to pay for one. You can take it anywhere you go, and tune up easily and quickly. As long as your phone can handle it, you can use it! Many people often wonder if there’s any stock to be put into using a web-based online violin tuner, and the answer is yes and no. Although there is stock to be put into the functionality offered, or rather the idea of how useful it would be to have a web-based violin tuner, in actuality, it’s not as viable. Why? Because if you can use a website on your phone or pc as a violin tuner, why not just download an app to do it? However that being said, there might come a time when you’ll need a web-based violin tuner, and you won’t have access to the app store on your phone. This website is pretty well thought out and written. It shows the four notes of the violin, as well as a few extra notes. If you allow access to your microphone, then it can tell you how close you are to the pitch. Over and above that, it can play out the notes for you to match with, which can help you in ear training. Can use microphone, or play notes for you to match with. In short, using this website as an online violin tuner can be useful, as it can show you the notes, as well as listen to your violin and tell you if your pitch is off or not. As a last resort, definitely useful, but always best to stick to a standalone violin tuner, or a violin tuning app. In conclusion, if you’re wondering how to tune a violin with a tuner, then this article should point you in the right direction. If you’re wondering what the best tuner for a violin is, or you’re wanting violin tuner reviews, then this article should help with that too. However, the thing that makes a violin tuner a good violin tuner is up to you. You need to use it and see if it’s right for you, whether it’s easy to use, and how accurate it is. Once you’ve found one you like, then that’s the violin tuner you should go for.